AVAIL 2.9.3 is now available for download at http://getavail.com/Download. *Note that if you haven't updated to 2.9.x you'll need to update both the AVAIL application and the AVAIL Content Browser for Revit. Microsoft created all kinds of havoc with their Windows 10 Anniversary update but we're on it! If you experienced any crashes or hangups after updating Windows 10 you'll find relief in AVAIL 2.9.3! Now you can drag & drop Revit Drafting Views, Schedules and Groups directly into your current Project through the AVAIL Content Browser for Revit! Ongoing bug squishing and user experience tweaks! Register for an upcoming AVAIL for Revit and AVAIL Enterprise webinar! Heading to Autodesk University next month? You'll find AVAIL on the show floor in booth #2783. Plan to stop by the demo theater for a sneak preview of some exciting new features including AVAIL Stream. 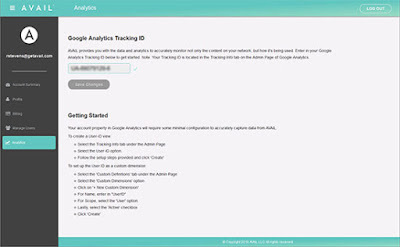 View your AVAIL Analytics using Google Analytics! Now you can gather the information you need to better manage your content including most accessed Channels in AVAIL and most searched for content. Information is tracked in Google Analytics as "Events" which are made up of Categories, Actions, Labels and Values. Note that by default Google Analytics date range is set one day behind. If you want to see current data you'll need to adjust the timeframe to include today. If you're using advanced BA and BI tools such as Tableau or Microsoft Power BI you can import your Google Analytics data for further analysis. More to come including AVAIL Content Browser for Revit analytics! Copyright © 2016 AVAIL LLC, All rights reserved.